Plant tissues. Metaphloem and metaxylem. Atlas of plant and animal tissues. Organ: stem, metaxylem and metaphloem. Primary grow. Species: A, B, C: malva (Malva sylvestris); D: corn (Zea mays). Technique: paraffin embedding, sections stained with Alcian blue / safranin. In this figure, metaphloem and metaxylem of a dicotyledon plant (figures A, B y C) and of a monocotyledon plant (figure D) are schown, both having primary grow. Figure B is a magnification of the squared area in figure A. Figure C is a magnification of metaphloem observed in figure B.
Longitudinal section of metaphloem sieve tubes showing lateral sieve plates (dotted line). During primary grow, metaphloem is the main conducting tissue. Monocotyledons are good material to study metaphloem since sieve tubes and companion cells clearly show different sizes. In transverse sections of dicotyledon stem, metaphloem is composed of sieve tubes, companion cells, and parenchyma cells. However, parenchyma cells are not observed in the phloem of monocotyledons. In longitudinal views, sieve tubes are like long tubes composed by rows of cells joined by sieve plates located at the cell ends. Sieve tubes lose the nucleus during differentiation, and they become ruled by companion cells. At light microscope, sieve tubes look clear, as if they were empty cells, but they have a small amount of cytoplasm close to their cell wall. Main cell types of angiosperm plant phloem. Longitudinal section of metaxylem showing the typical secondary cell wall thickenings. 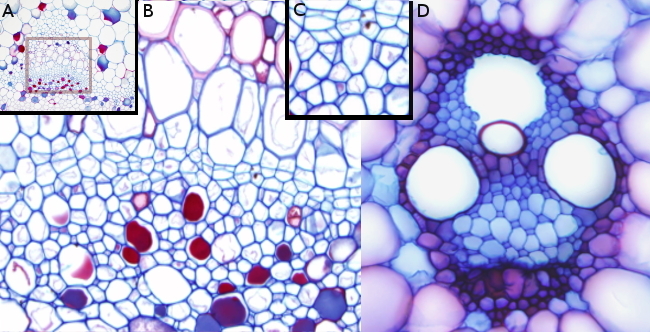 In transverse secitions of vascular bundles of stems of monocots, metaxylem shows two or three cells known as vessel elements, and a lysogenic cavity produced during development by the tear of protoxylem. Parenchyma cells and sclerenchyma fibers are common in metaxylem. 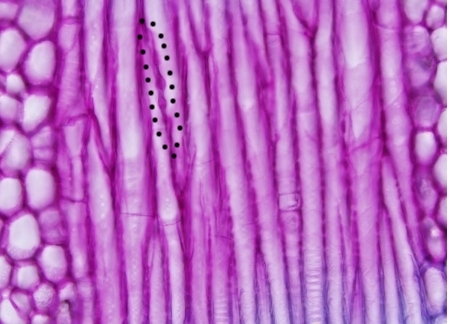 However, sclerenchyma fibers are not easily distinguished from small tracheids, another cell of the xylem, since both cell types have both similar cell wall thickness and similar size. In longitudinal sections, vessel elements are identified by their characteristic thickening of the secondary wall. The essel elements of protoxylem show secondary wall thickenings forming rings or helices, but they are later substituted by reticulated and dotted thickenings in the metaxylem and secondary xylem. Main cell types of angiosperm plant primary xylem.